It was surprisingly hard to find the right goose for this gif. If you’ve never stared at a giant game map thinking ‘Where would I be if I were geese?’ you’re missing out. There’s been some talk on Kotaku lately about geese, but not about The Witcher 3. Let’s fix that. 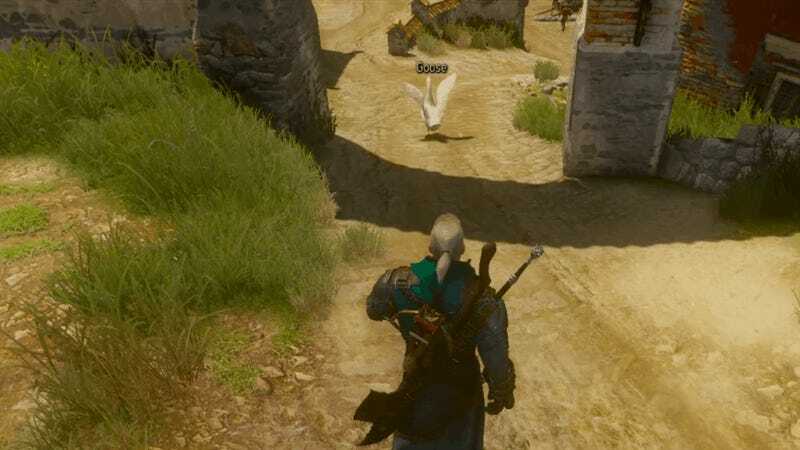 I love the geese in The Witcher 3. They get so flummoxed when you chase them. Look at their silly waddle and how they throw their wings in the air indignantly when they run away. Once I was chasing a bunch of geese around and I accidentally lit them all on fire. Over the weekend I chased one way out into the woods to see if it would find its way back to town, but then I got attacked by monsters and I lost it. I wonder where it ended up. And this is why I will never finish The Witcher 3.